Dotonbori (道頓堀) is located in the south of Osaka City. It is popular spot for food and restaurants. It is well known as "Kuidaore," means eating too many food so that you spend all money. There are many famous restaurants, such as Kani Doraku and Tuboraya. Also, it is famous for Gurico Neon sign. You can eat all kinds of Osaka Delicacies. There is a sea-bus to access the spots. Dotonbori was canal built in 1615 by Yasui Doton, and became famous for theatre districts. Around 1660, many theaters opened and became popular Kabuki and acting spots in Osaka. Currently, Dotonbori is one of the most popular food and restaurant districts in Osaka city. 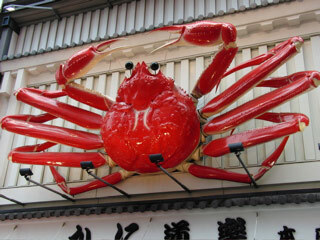 There are hundreds of restaurants which you can eat all kinds of Osaka Delicacies.